On the North Shore of the island of Kauai Hawaii lies Kee Beach. This is the beach used in the TV mini series the Thorn Birds. 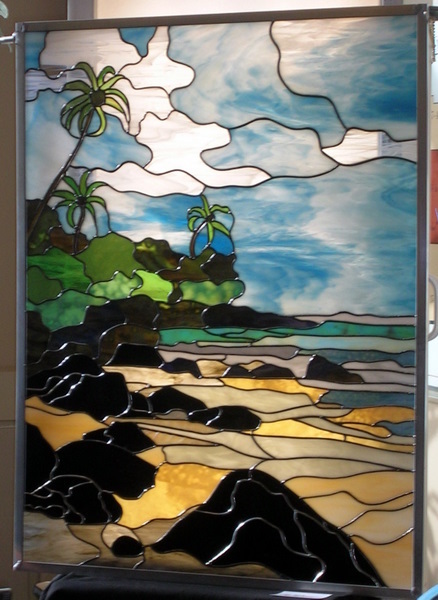 This panel measures 30 x 38 inches and was commissioned for home near Edmonton Alberta. We used black patina on the solder seams, except for the large rocks, which were left silver for effective contrast. This Owl fits our desire to portray wildlife in a most realistic manner. The panel with the frame measures approx 2 feet x 3 feet. The frame was constructed by Robert Bryce Designs of Innisfail and made from birch saplings cut in the foothills of the Rocky Mountains west of Innisfail. 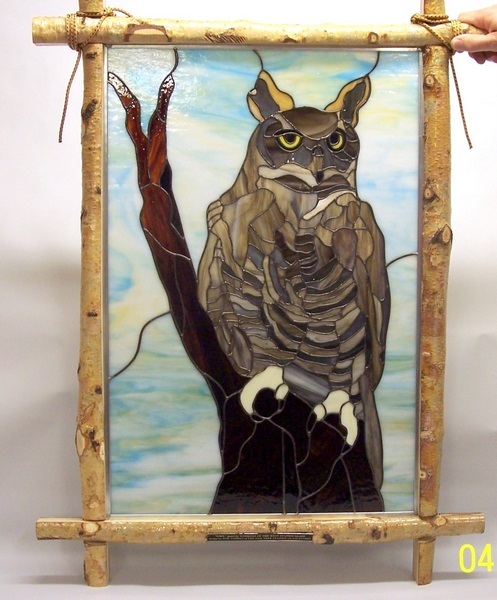 This Owl was accepted by Parks Canada – 2007 Brilliance of Birds Stained Glass Art Show – Kootenay National Park – held at Radium Hot Springs British Columbia, and now hangs in a home in Radium BC. 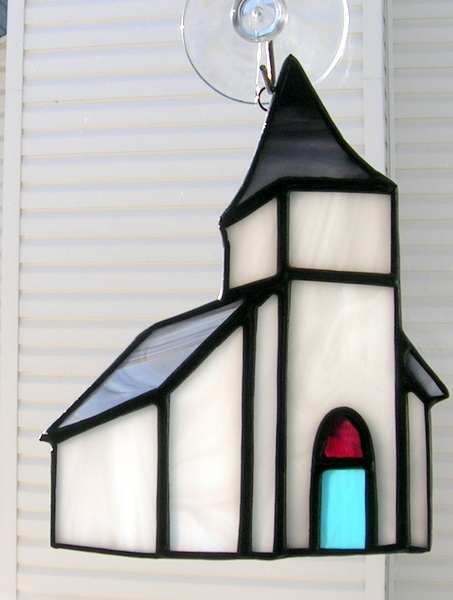 The Historic Markerville Church is over 100 years old. As members of the Stephan G. Stephansson Icelandic Society we designed the church from photographs. This item can be purchased during the summer at The Historic Markerville Creamery in Markerville Alberta. A large window approx. 8 plus sq. ft. 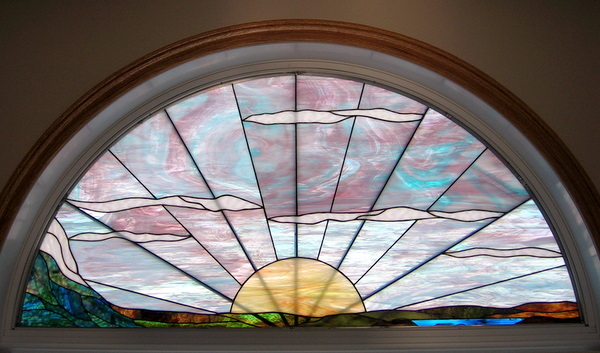 This window is located over a large living room window in a home in Central Alberta. This window was featured for the month of December 2006 on Dragonfly Software’s California site. In December, 2006 we were featured by Dragonfly Software’s “Design of the month”. 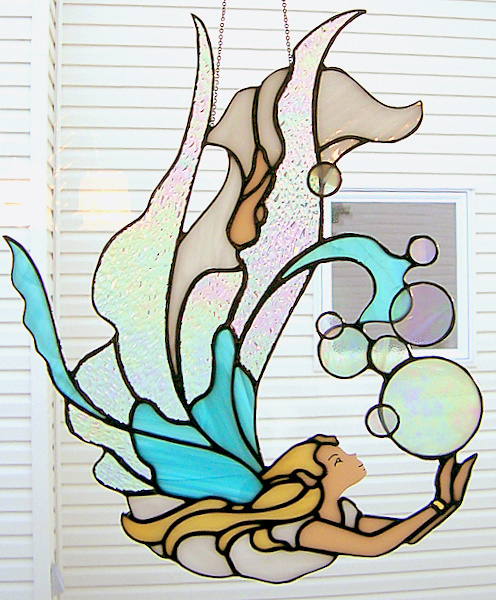 Aeolean The Wind Dancer – Airy and insubstantial as the bubbles she chases. Is that her reflection on the surface tension? As the bubble bursts, she is gone. Did I really see her? Pattern enlarged, this piece hangs in a Central Alberta home. 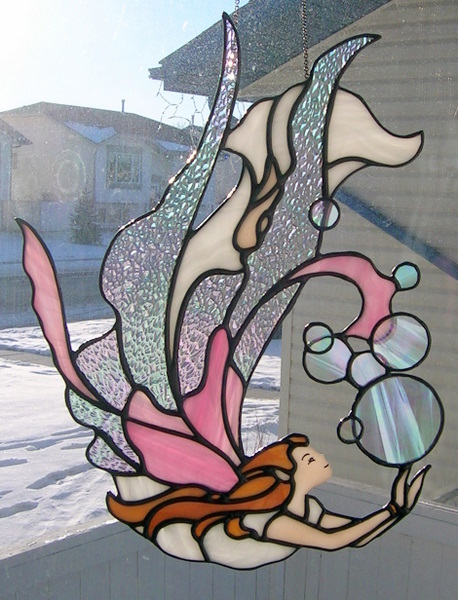 We also made The Wind Dancer in Blue Glass. This beautifully made Shamrock is even more meaningful to me as I have an Irish maiden name.